The subjects of science are often witnessed through microscopes, tiny squiggly things writhing in a petri dish. But last week as a large research boat drifted through the Gulf of Farallones National Marine Sanctuary, science was getting scrutinized through binoculars and even the naked eye. For the 12th year in a row, researchers from Point Blue Conservation Science, the Gulf of Farallones and Cordell Bank Marine Sanctuaries were spending 10 days on the ocean outside the Golden Gate Bridge taking a scientific snapshot of ocean life. “Our goal is to understand how ocean conditions affect food for birds and whales,” said Jaime Jahncke of Point Blue. 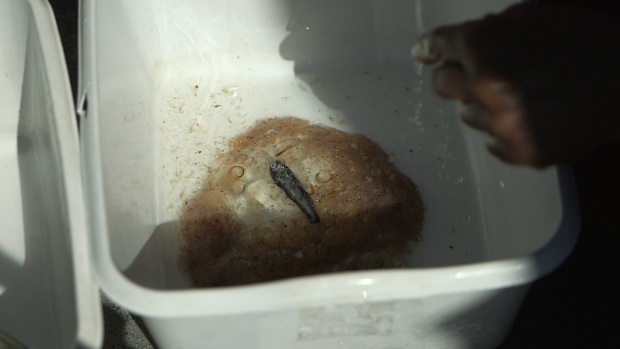 Over several days the team collected krill samples, tested for signs of ocean acidification and attempted to lay eyes on as many critters as possible. “Our sampling effort looks at birds, mammals, krills, boat activity ,” said Jan Roletto, research coordinator for Gulf of Farallones National Marine Sanctuary. 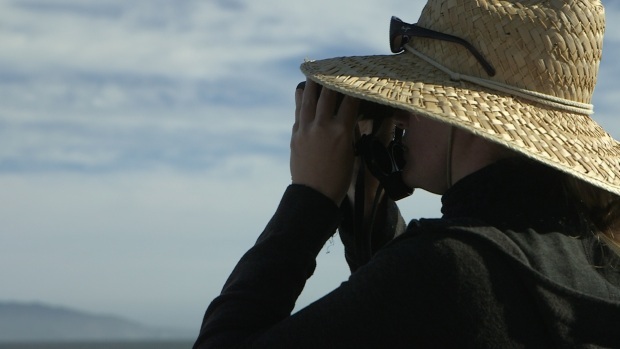 A researcher scans the ocean for seabirds during a recent scientific cruise in the Gulf of Farallones National Marine Sanctuary. But this year’s gathering turned-up some unusual phenomenon, which scientists believe are signs of an El Nino year – which draws unusually warm waters to Northern California. For the first time in decades, scientists saw schools of hundreds of common dolphins which aren’t common to the Bay Area, but rather the typically warm waters of Southern California. During an expedition earlier this summer, the scientists noted fewer krill in the ocean which in turn was driving humpback whales closer to shore near Half Moon Bay and Monterey to seek out fish. A small fish sits among a sampling of krill collected by researchers during their scientific cruise. In addition to dolphins, Roletto said the group spotted other typically warm water creatures venturing north. Sleepy-looking sun fish were seen basking in the waters. And the researchers’ nets pulled up a curious traveler — a small red pelagic crab that normally makes its home near Baja. “The last time I personally saw in this region red pelagic crabs was in the 1983, 1984 El Nino,” Roletto said. Roletto said the lack of krill and juvenile rockfish which are normally abundant along the coast was posing hardships on common murres which have been recently turning-up starving and dead on Northern California beaches. Roletto said the young birds count on juvenile rockfish to survive. She pointed out similar die-offs occurred in past El Nino years. As part of the research, observers armed with binoculars lined the boat’s upper deck, calling out every bird and mammal along a set swath of ocean near the Farallon Islands. Sea lions, whales and even plain old seagulls became part of a moving record of the area’s life. The results are compared to previous years’ records to help paint a picture of the changing conditions. A research team hauls in nets designed to collect krill and other small sea creatures in the Gulf of Farallones National Marine Sanctuary. Jahncke stared off across the churning waters as the boat bobbed and jibed across rolling swells — when something suddenly caught his eye. In the distance came the telltale blowhole spout of a whale. “Do you see it?” he said enthusiastically, quickly tapping record of the sighting into his computer. Then he leaned back to appreciate the view, watching as the ocean swallowed the meandering giant.